Coming to a paving slab near you! 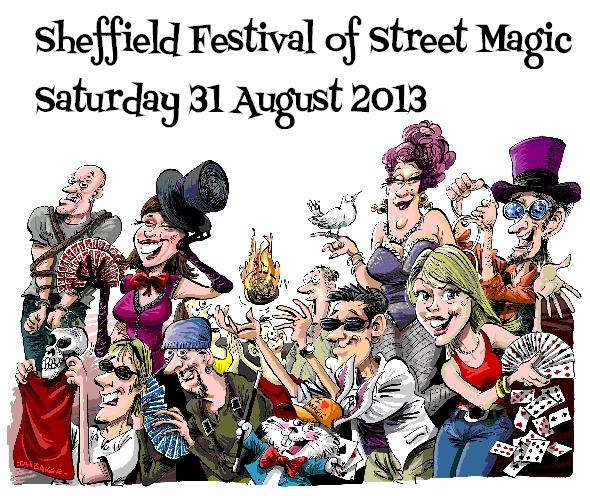 Many of my readers (if the plural isn’t overly optimistic) will have seen the buzz on FaceBook over the past couple of weeks relating to the forthcoming Sheffield Festival of Street Magic. The date is Saturday 31 August from 1.00 to 7.00 p.m. Street performances, with a stage finale, will be happening in various places around the centre of Sheffield. Actual times and venues (streets, squares…) will be announced shortly. I had further talks this morning with Sheffield Council about venues, timings, ‘green room’, etc. Lots of organisation to do; more details to follow. I am currently compiling a list of those who wish to take part (a few stewards would be handy, as well as performers). Email me and I’ll make sure you’re on the list. There will be a point with facilities for displaying performers’ publicity information, passing out business cards, etc. So if you’re taking part make sure you have some material available. Again, if you’re interested in getting involved, or have ideas, please get in touch (see the About Magick page of this blog). Let’s do this, and make it a big annual event! As soon as I have a few more concrete details I’ll post them here and on the FaceBook events page. Many thanks to Ian Baker, ace cartoonist and magician, for the great illustration (above) which we’ll be using on publicity material. Look out for it! Just to say again I’d love to help out. Don’t have anything fit for stage at the minute but I’d be glad to freak some Yorkshirefolk out on the streets of Sheff. Thanks for that, Dan. I’ll be in touch. Intend to arrange a meeting in a couple of weeks to begin to finalise (?) what, where and when. Yes I’m organising. It’d be great if you could take part! We’ll talk soon. Many thanks. This looks like a fantastic event Russell, well done for organising it. I’ll definitely come into town for the afternoon to see it, there should be lots of excellent photo opportunities as well as the great magic. Great! Be sure to call in at the Festival Centre near M&S on Fargate and say hi. And we should be able to give you a few tips on the timing of acts too, to make best use of those photo opportunities. I certainly will do. I used to do a lot of magic myself and have been to the shop a couple of times, so I’d like to combine my interests of photography and magic. What could be better! See you there.